Info "Chisel the marble block! Not everyone can have a chiseled body like Wario." 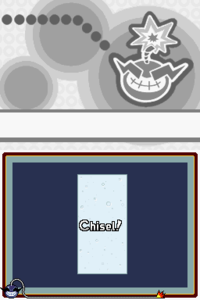 Lose Your Marble is a microgame found in the Touch Training stage in WarioWare: Touched! The name is a play on the idiom "losing one's marbles", which is another way of saying that someone has gone insane. The objective is to tap the marble block until it is chiseled into a statue before the time runs out. If done so, the game is won. 1st level difficulty: A large portion of the marble is removed with each tap. The statue is a flexing man. 2nd level difficulty: A moderate portion of the marble is removed with each tap. The statue is a Moai. 3rd level difficulty: A small portion of the marble is removed with each tap. The statue is a toilet. Lose Your Marble appears as one of the microgames in the Super Smash Bros. Brawl, Super Smash Bros. for Nintendo 3DS, and Super Smash Bros. Ultimate stage, WarioWare, Inc. To win the microgame, the players have to chisel the marble block by attacking it repeatedly. The player that chiseled the final piece off the marble block will win the microgame, and he or she may be awarded with a power-up. This page was last edited on November 4, 2018, at 20:18.